In honour of Halloween this year, we thought we'd feature this incredibly unique wedding - a brave couple from Los Angeles who decided to theme their Big Day with all-things-Halloween! Mary and Stefan love stripes so this was the perfect theme for them. Don't you just love the addition of the black-and-white-striped bow at the back of her wedding dress, and on the groom's bow tie? While this wedding may not be traditional, we think its such fun! 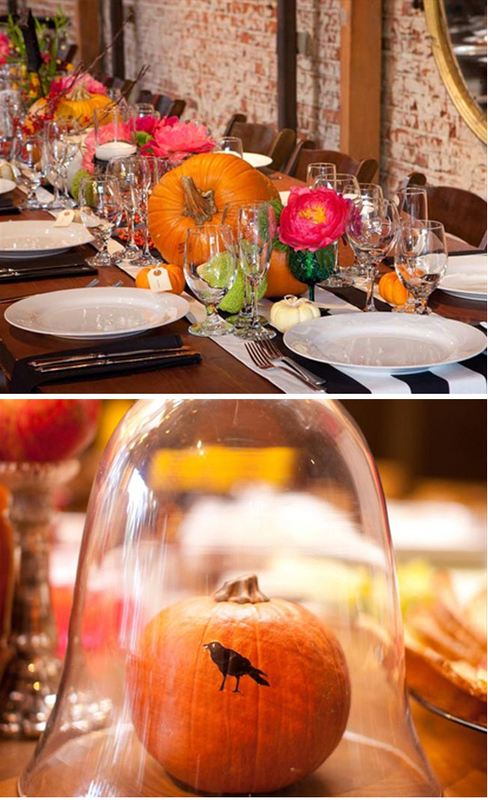 They chose black and white striped fabric and this set the scene for non-cheesy Halloween décor, as well as the inevitable bright orange pumpkins placed along the table runners. The hot pink flowers added colour to the black and white theme, and the bright pink and yellow blooms in various coloured glass containers added a lovely touch. 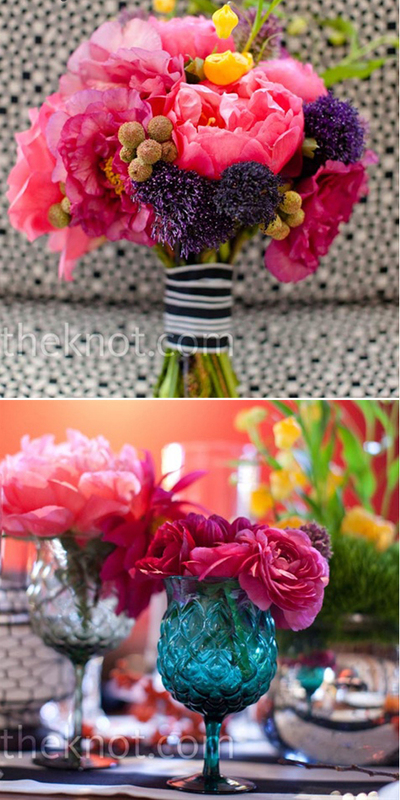 The bouquets were made of peonies, dahlias and roses, tied with striped ribbon to bring the look together. The lily boutonnière popped against the groom's grey suit. For name tags, the couple used a friend's old typewriter to print the guest's names; they chose plain manilla envelopes and stuck them onto corkboard covered with black and white striped fabric.